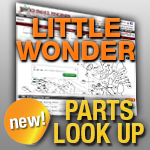 Our supply of lawn mower and small engine Mufflers and Muffler Accessories can solve your exhaust problems. If you need a new lawn mower muffler, exhaust manifold, muffler guard, or exhaust pipe, Jack's has the parts to keep your equipment quiet. A small engine muffler helps reduce the noise level of your generators, lawn mowers, chainsaws and other power equipment. The exhaust gases enter the muffler and pass through the resonator chamber that works to cancel out the sound waves produced by the engine's combustion. If there are any cracks, leaks, or holes in your muffler, your equipment will operate louder because the exhaust sound waves aren't being completely contained. Search for a replacement muffler from our popular manufacturers, like Briggs and Stratton, Honda, John Deere, Kohler, Stihl-Aftermarket, Tecumseh, and more. We also carry Quiet Mufflers for your small engines.